Personal stories and photos from our customers practically bring these products to life. You can search our blog by product, dog vest size, or color. Creese Syred's German Shepherd dog Czar lives and works in Australia. He is a trainee Search And Rescue dog. 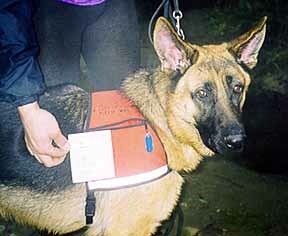 Czar is wearing his ID Cape dog vest which he uses while training. Creese has written "IF LOST OR FOUND PLEASE OPEN" above the pocket. The pocket holds a card that reads: "If you find this dog, please don't be scared. Give him some fresh water and call [his phone number or vet's number]. He is a member of the German Shepherd Dog League Australia, and N.S.W. Tracking & Rescue Dog Club." ©2012-2017 WolfPacks.com ⦿ All rights reserved.